This was my second follow up appointment. Wonderful care and service with lots of explanations and cutting edge dentistry and technology. It was cool to see pictures of the work done to have a better understanding. I’ve started spreading the word. I have people interested in coming over to the practice. I know my husband and kids will be joining as patients. Planning a wedding is a lot of hard work. 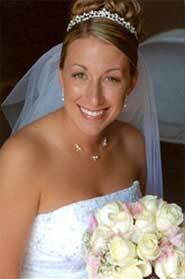 I wanted everything to be perfect, especially the wedding photographs.While I was at my scheduled dental appointment, Dr. Herschfus discussed how teeth whitening, would really show off my beautiful smile. I took his advice and followed through with the treatment. I was amazed at the difference! I have had nothing but compliments and my wedding photos are proof at what a great job Dr. Herschfus had done! ….. My first experience at Dr. Herschfus’s office was in August of 2010. My wedding was only a few weeks away and I wanted to have some whitening done for the big day! I had been referred to Dr. Herschfus by a friend, who had nothing but great things to say about ALL of the staff at the office! Since customer service is so important to me, I decided to give it a go! I was so happy with my first visit in the office. All of the staff were very helpful, welcoming, and interested in getting to know me as a patient, before performing any work in my mouth. What a comforting feeling! I was EXTREMELY happy with my whitening. My teeth were not only one, but many, many shades whiter! I was truly impressed and couldn’t believe how drastic the change was! The day of my wedding, I smiled with full confidence and joy! Most of the time, you become anxious about close up pictures and imperfections, but I knew that even the closest picture would still look great! The last thing you want to worry about on your wedding day are yellow, stained teeth! I received many compliments about my smile from our pictures! I will continue to visit Dr. Herschfus and his wonderful staff in the future. When it comes to dental work, there is no better feeling than having someone who cares for you as a person first, and comforts you through any procedure! ……. Have you ever wondered when faced with a dental decision if you made the right one? When I was 14 years old I had the unfortunate experience of fracturing my front tooth. When presented with my options for restoring the tooth my parents opted for the conservative approach in order to save money and time and the tooth was bonded. Later I opted for a crown and when that failed I had a flipper made. The crown became loose and still I chose the “less expensive” restoration which was to do a root canal and then a crown lengthening procedure in order to get a better fit on a new crown. As time went by the root fractured and I had to have an extraction. Once again I was wearing a flipper. By the time I decided to have an implant done I had significant bone loss which complicated the procedure. I have an implant today that I am very pleased with because my tooth is solid. In hindsight, I wish I had opted for an implant right away. My decision to save money ended up costing me more in the long run. The optimal treatment for restoring a missing tooth is definitely a dental implant! I tell everyone — love my dentist. I found Dr. Herschfus through an online service when I needed to have a tooth extracted a few years ago. I didn’t have any insurance, then, but Dr. Herschfus and his entire staff were so kind and friendly that I vowed I would come back as soon as I did have coverage. Since then, I have continued to have nothing but positive experiences. The hygienist is almost more solicitous of my comfort than I am, and Lesley, at the reception desk, is always friendly and upbeat. Without going into (literally) gory detail, I’ll just say that the improvements in my mouth are drastic and I am practically giddy sometimes at how much better I look and feel. It seems obvious to me that Dr. Herschfus and his staff care about their patients and the atmosphere of mutual respect and camaraderie makes the office a wonderfully pleasant place to visit. I want to thank each and every one of you at the office; when I enter your office it’s a pleasure to see everyone with just a great smile and personality. You have made every one of my visits a pleasure during the treatment that I am receiving. When I sit in your chair and you explain exactly what you will be giving me that day – this is very helpful to me and knowledgeable. And especially when you put those “ORANGE SUNGLASSES” over my eyes it makes me feel that I am going to the Bahamas for a vacation. The experience that I received at your office is fantastic and I look forward to coming. Thanks again, Dr. Herschfus and staff for your kindness, your patience and expertise. A good number of years ago I found myself in need of a new dentist. I asked around work and Dr Herschfus’ name kept coming up. I decided to make an appointment and in retrospect I’m very happy I made that decision. Since then I’ve enjoyed superior dental care and marked improvement in my overall dental health. In short, my teeth have never felt better or looked better. Dr. Herschfus has put together a friendly and knowledgeable support staff that is in my opinion- without peer. I used to dread going to the dentist, now it’s a very positive experience for me and I actually look forward to my appointments. Now when people ask me if I know a good dentist I can refer them to the best! 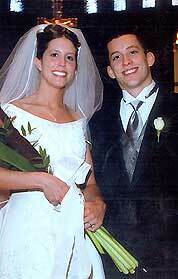 Our patient, Michelle posing with her brother, Eric, on her wedding day. Dr. Herschfus did a wonderful job on my last two fillings. I can’t EVEN tell they are filled! They feel great and they really look like my other teeth, well . . . better actually. Thanks again! I’ve been a patient at Doctor Herschfus’ office for over 20 years now and I couldn’t ask for a nicer group of people to take care of my teeth they’re like an extended family. Thank you again for being very kind and always willing to work with me in many ways and my schedule. Thanks again. With sincere thanks. Thank you Dr. Herschfus and staff your thoughtfulness was appreciated more than you know. Thank you all so much for all your help and kindness. My experience with you was pure joy, this from someone who has had a fear of dentists all my life. God bless you all. Thank you for the great dental work and your kindness to me. My wife, Bernadette, and I have been with Dr. Herschfus for many years. He has been friendly, professional and very competent. We couldn’t be happier. We do strongly recommend Dr. Herschfus. 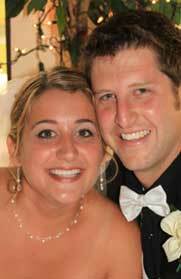 Mr. & Mrs. Donald W.
“My dental experiences have not always been good ones, in fact I hated going to the dentist. That fact was obvious, because of the condition of my front teeth. When I came to Dr. Herschfus, I had not smiled without covering my mouth for several years. I was extremely embarrassed and ashamed of my front teeth. I expressed these concerns to Dr. Herschfus, and he understood exactly how I felt. Dr. Herschfus has such a comforting and gentle personality, that instinctively I knew everything was going to be all right. Dr. Herschfus started treatment on my front teeth, and I was pleasantly surprised by the difference. The difference was like night and day, I was truly amazed. He definitely has the magic touch and is very good at what he does. I cannot thank him enough for the difference he has made in my life. I can’t stop smiling. I look at my smile in the mirror a 100 times a day. My confidence and self esteem level has increased. I am no longer ashamed or embarrassed by my front teeth. Thank you, Dr. Herschfus for giving me my smile back. Dr. Herschfus has been our dentist for 6 years. He and his staff have always given great service with a personal touch. Dr. Herschfus recently did some work on my son Zachary’s front teeth. Zach can’t stop showing everyone we meet, his new look. He loves them and it really has given him more self confidence and I like seeing him smile more! Thank you Dr. Herschfus, for everything! I am in the fashion industry and my appearance is so important. Dr. Herschfus made beautiful porcelain veneers for me, they look so natural. I feel more confident now than ever before and created the image I want. Thank you Dr. Herschfus, for my new smile, I love it! My dentist’s name is Dr. Herschfus. I have been coming to him for 13 years. He and his staff have helped me get over my fear of going to the dentist. They do quality work. It is a painless and relaxing experience. My teeth were always a source of discomfort for over 25 years. I thought this was normal, then when Dr. Herschfus replaced all my silver fillings with crowns and composite fillings, all pain is gone and my teeth feel normal. “We love your referrals!” Our 2 Way $25 Gift Certificate! Toward any restorative service, new & referring patient. Call today for details! For only $95, you can receive a series of X-rays and a comprehensive exam! This special is valued at over $200. 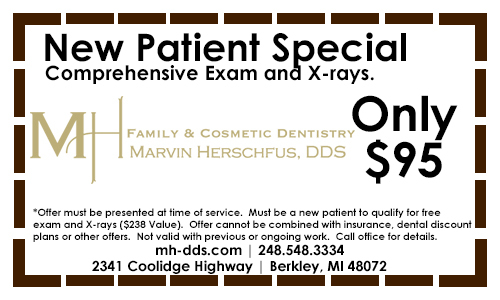 To learn more about our new patient special, please contact us at the dental practice of Marvin Herschfus Family and Cosmetic Dentistry today by calling (248) 548-3334. Our friendly dentist and dental team look forward to caring for your smile! A really special happy birthday to my father on becoming 101 years old today. Happy Spring everyone! Is it time to straighten up? We are excited to introduce MTM Clear Aligners to our office!